Mo Wilkerson (restructure) – Is he dominant? No (he never really was). But at 9-10 million a year for the next 2 years, I can live with it. If we cut him, its just going to create another hole. Plus, he has been turning it around lately. 1st Round – Josh Rosen (QB) UCLA – There have been constant rumors about the Jets scouting UCLA games this year and I think this is Maccagnan’s guy. Macc goes big and gets his guy at the top of the draft. Jets franchise will revolve around Rosen and Jamal Adams for the next 10 years. First 2 picks are no-brainers. Not crazy about Penny, but that's limited exposure on my end. Honestly, I struggled with figuring out what I wanted to pay Enunwa. I feel like the team has some wiggle room with being cheap on the extension because of the injury, but the team has to protect itself at the same time. I would like to get more than a year out of the deal. How much do you think we should pay him? Penny can ball, you have to watch some of the video on him. Who is going number 1 to Cleveland? 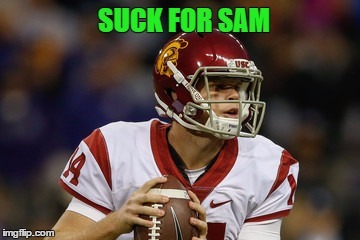 Is this assuming Darnold comes out? And Cleveland takes him? But yeah, I do that deal for Rosen. At the end of the day? I think Cleveland is going to pick Lamar Jackson at number 1. That's not what I would do, but after Michael Vick and Cam Newton, I've seen enough occasions of the super athlete QB going number 1. In 2012, there was even talk at some point about RG3 leaping Luck (it was obviously foolish, but the fact that it was even brought up says a lot). Lamar Jackson is being underrated. At the end of the day, he is going to blow up the combine, put up monster stats the last 2 years and he has improved as a pocket passer. He's a better QB than Watson IMHO. Is there another Watson who's first name isn't Deshaun? I think it's gonna cost us more to move up that high. We'll need to throw in one of our 2nd rounders to make that move. Way too many teams are going to want to move up which will turn this into a serious bidding war. But I'd still make the trade even if we added our late 2nd rounder to that deal. Ask the average Eagles fan what they gave up for Wentz right now and they'll tell you whatever it was, it was a steal for them.